Homes for Heroes wants to thank every military member for their service. That’s why we provide military discounts on homes, whether you’re buying, selling or refinancing. We also look to maximize the money you save by leveraging other benefits. For example, in addition to the military discounts on homes we provide, you can also take advantage of your VA home loan benefits. You qualify for the military discounts Homes for Heroes provides if you are an active military, reserve or veteran member of any branch of the armed forces. Here’s how we do it. When military members are looking for discounts on their next home purchase, they often start with a VA home loan. These loans typically offer above-average terms because the VA guarantees a portion of the loan. While VA loans are great for military members, applying and securing the loan can be a challenging if you’re looking to buy or sell a home while your spouse is deployed. Homes for Heroes works to make the process easier. Military members who sign up to work with Homes for Heroes will be automatically matched with a specialist in your local area. Our mortgage specialists are experts at working with VA loans and will handle all the details to assure you receive any available VA home loan benefits. VA home loans help military members save money with better terms, but Homes for Heroes goes a step further. When you work with our real estate, mortgage, title and home inspection specialists, you can save significant money through reduced commissions and fees. On average, military members who work with our specialist to buy or sell a home save an average of $2,400. At Homes for Heroes, we do everything we can to help military members save money. Many companies across the country also offer military discounts. Check out our Local Deals page, where we’ve compiled a list of additional savings and discounts available to military families. Providing our military members exceptional service, significant saving on their home, and special military discounts on everyday home-related products and services is our way to say thank you for your service. We would be honored to serve you. Are you are a military member, or a spouse of a military member looking to buy, sell or refinance a home? 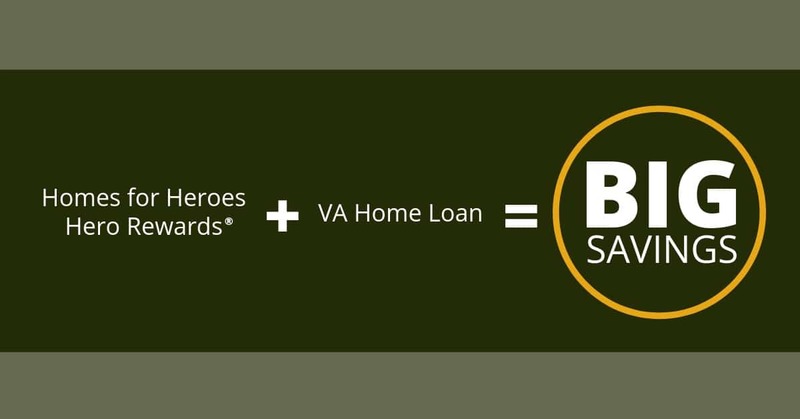 Sign up with Homes for Heroes and begin the process to saving money.